Originally released during the high point of the PS3/Vita era, Dragon’s Crown fused George Kamitani’s beautiful character (and food!) designs with that of an arcade-era brawler. Leaning more heavily on its D&D influence than that of Capcom’s Shadow Over Mystara from the mid-90’s, this adventure brought in persistent leveling and a desire to keep raiding the same dungeons for loot and glory. Those five years have helped Dragon’s Crown become a strong contender for longevity in the genre, but even its art style couldn’t completely stand the test of time. With the added power of the PlayStation 4 and subsequent Pro, Atlus and Vanillaware decided it was time to revisit Kamitani’s greatest adventure with a full remaster of Dragon’s Crown Pro. Dragon’s Crown Pro guides teams of up to four players through a campaign of political intrigue, dungeons of various locales, and of course, dragons, all under the glim narration of an unseen gamemaster. First tasked with helping to restore the balance of power in a kingdom without a king and later defending it from an Ancient Dragon that threatens to destroy it all, it’ll take a band of rogues to keep the peace for just a little while longer and maybe earn a little coin in the process. 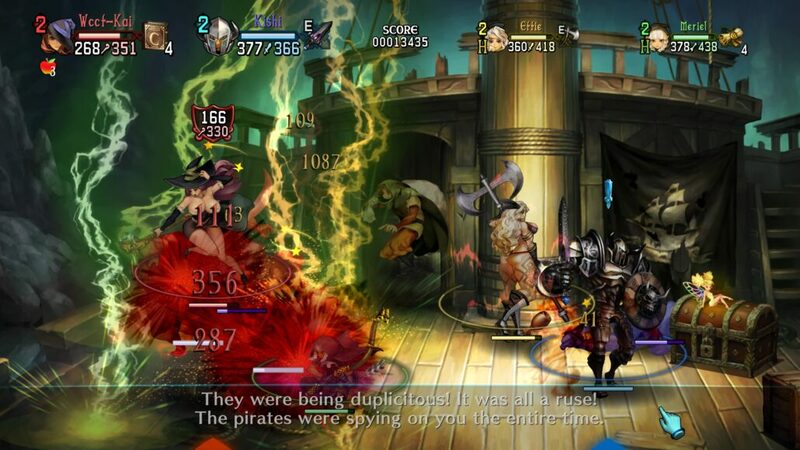 Being molded in the beat-em-up genre with an RPG twist, Dragon’s Crown Pro’s combat is all about punching and magicking your way through hordes of fodder enemies by way of stylish combos and various weapons strewn about the stages. Given that it’s identical to the last generation’s release of Dragon’s Crown, the beautiful artwork and character movements aren’t the most fluid at times, with combat sometimes feeling sluggish given the delays in attacks and each frame of animation being hand-drawn. It’s the same complaint I had from the PS3 release but since it’s the exact same game with a fresh coat of paint, that was to be expected. To say that Dragon’s Crown Pro is beautiful on the PlayStation 4 Pro is an understatement. The entire framework of the game, from the individual character models to the HUD to the delicious mid-quest food have all been redrawn in 4K. Accompanying the enhanced visuals are an orchestrated soundtrack (the original is also an option) and the ability to mix and match Japanese and English voices for characters and narrator alike. It’s difficult to quantify whether Dragon’s Crown Pro falls within the remaster or remake category, but I would liken it to a full remaster that’s drawn solely within the lines of the original 2013 release. Up to four players can group up together in couch co-op or online play (and a healthy mixture of both across all three Sony platforms), each taking control of one of six distinct character classes. Three different melee classes, two spellcasters, and one plucky Elf archer make up the roster of classes, each having their own unique skill tree and playstyle although there’s nothing wrong with playing as a team of four Dwarves if you want maximum beefcake appeal. The bones of fallen soldiers can be picked up throughout the dungeons and brought back to the town’s sole priest to reincarnate as NPC help so you’ll never have to face the adventure alone. Dragon’s Crown Pro’s main campaign shouldn’t take any more than ten hours to play through the game’s nine primary dungeons. As the story goes on, a secondary path (‘B’ Route) opens up to the player within each dungeon. This secondary route is essentially an entirely different level, from new path rooms and traps to a completely different boss at the end guarding one of nine talismans necessary to withstand the attacks of an Ancient Dragon who marks the end of every great adventure. 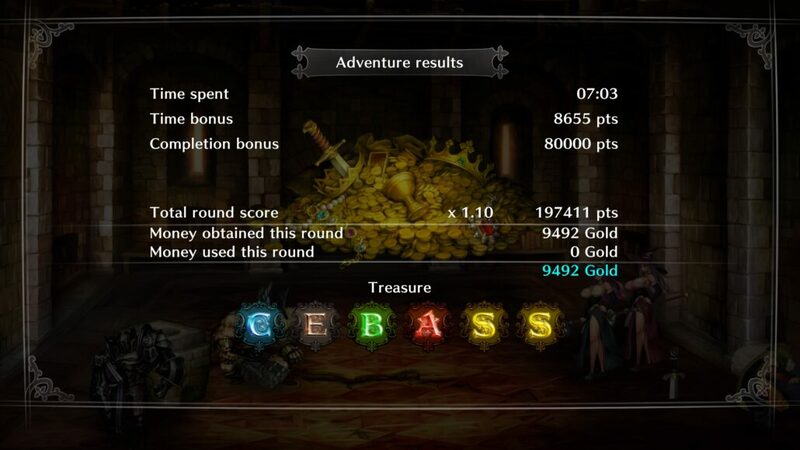 Once the Ancient Dragon is defeated, what else is there to do in Dragon’s Crown Pro? For starters, much like most loot-driven adventures, a higher difficulty level promises gear that can boost attacks to much more substantial numbers, a higher level cap, and other mechanics that can further test the player’s mettle. To do so requires exploring two of the game’s lengthy and challenging towers that remix the existing levels with the promise of greater rewards and challenge. 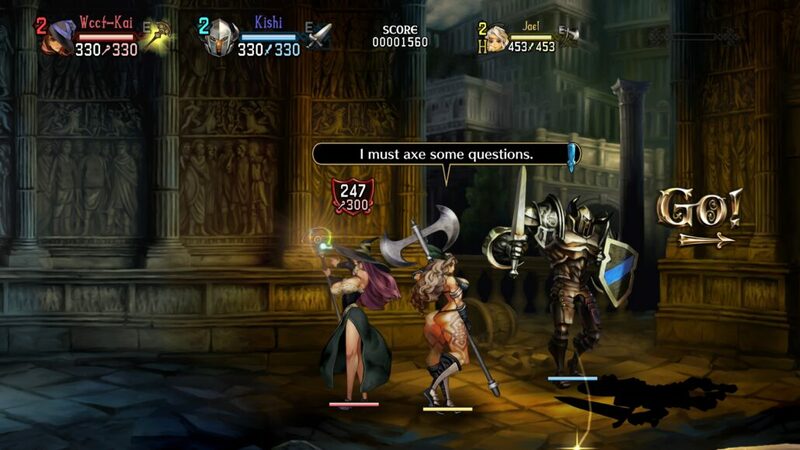 While the actual levels are limited in comparison, Dragon’s Crown Pro utilizes those levels in a randomly generated fashion to keep players motivated on their quest for a new axe or magical wand. All of the levels can be replayed in an infinite loop, starting one within one random dungeon and playing each dungeon in sequential order. In between every few levels, a brief cooking minigame helps recover stamina and imbue players with temporary buffs to increase their chances of survival. After each dungeon, players can return back to town with their newfound goods and experience, or press their luck with another dungeon run. Each sequential run gives a higher modifier to gold earned, loot drops and quality, and score (which is then converted to experience with a percentage based upon the difficulty chosen), with added risks associated with it. Players can equip multiple item loadouts which will be essential for these dungeon delves because of how quickly gear can degrade, requiring a brief trip back to the town merchant to repair. Two other dungeons bring more randomly-generated fun, remixing the dungeon rooms in unique ways. 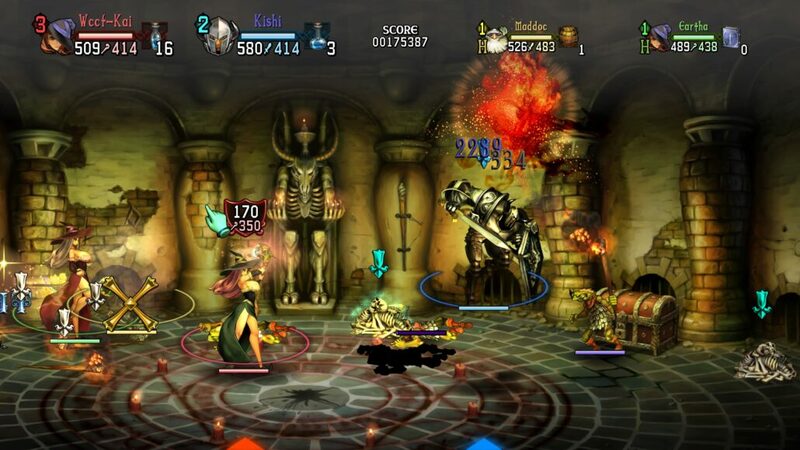 One of the two, the ‘Labyrinth of Chaos’ remixes stages and enemies for a 99-floor dungeon crawl while the other, the ‘Tower of Mirages’ which was added as post-launch DLC to the original release of Dragon’s Crown, offers an endless challenge that can go on as long as the player has gear in working condition and enough health potions to last. If you can get a solid crew to play together across Sony’s three platforms, there are many hours of dungeon hunts to look forward to. 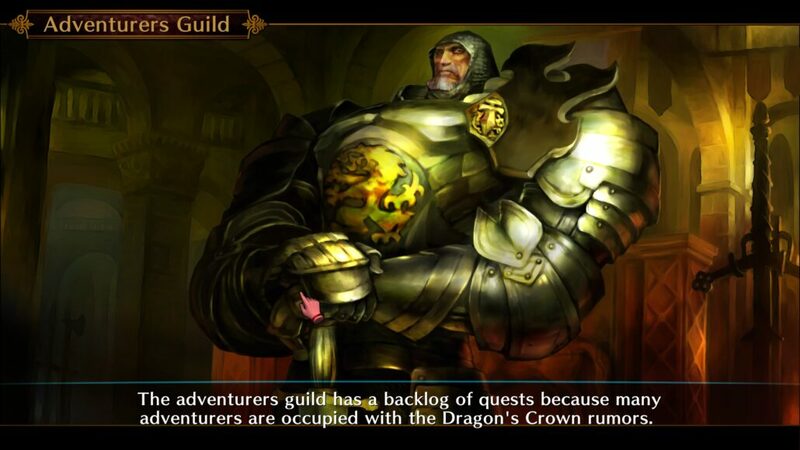 I absolutely adored the original release of Dragon’s Crown when I originally played it five years ago, but that time spent apart has revealed some of the cracks in its luster. Beyond the perpetually changing dungeons, there’s little to keep players coming back beyond the promise of better gear and more efficient killing. There are only so many rooms to scrolls your way through before the repetition kicks in. Being able to play with friends in the most lovingly enhanced rendition of Kamitani’s art to date is a beautiful thing, but sometimes the veterans need to sit this quest out and let the newcomers handle it.